In September 1683, the Polish King Jan Sobieski swept down from the heights of Kahlenburg and beat the Turks from the Gates of Vienna. It was a nail in the coffin for Ottoman designs on central Europe, and a mightily close call for the Habsburg capital. The grateful Viennese gave the Polish king a hero's welcome, and Sobieski was showered with presents by princes from across Europe. But the solidarity was not to last. Within a hundred years, Austria was helping to wipe an enfeebled Poland from the map as Russia and Prussia divided up the country like an enormous cake. As the partition documents were being signed, Austrian Empress Maria Theresa was apparently wracked by remorse. "She cries but she takes!" quipped the Prussian King Frederick the Great. Following the partition of 1772, Austria's Polish gains became the province of Galicia, with Lemberg (formerly Lwow) as its capital. Although Krakow managed to cling on to its freedom for a little longer, the Habsburg border now came all the way up to the southern bank of the Vistula, where the Austrians immediately built the town of Podgorze as an economic rival to Krakow. The remainder of the city was finally gobbled up in 1795, only to be liberated by Prince Jozef Poniatowski in 1809. The Prince was fighting for Napoleon, yet even after Bonaparte's defeat in 1815, the Allies awarded Krakow 'Free City' status. But this all came to an end after a Polish Uprising in 1846, and two years later the Austrians were firing cannons on the Old Town from the former Royal Castle of Wawel. By this stage, the Austrian Empire had barely sixty years left to run. And after such bloody beginnings, the Polish arrangement looked set to be a grim one until the bitter end. So how did it come about that the Poles came to be amongst Austria's 'most loyal subjects'? Why is it that the image of Austrian Emperor Franz Joseph (1848-1916) endures as one of the most trusty emblems that you'll find in Cracow, adorning restaurant signs, water bottles and countless knick-knacks? The mutton-chop whiskered monarch is as safe a choice for a shop sign as Churchill would be in England. He's the grand old teddy bear. (Suffice it to say that not in a million years would a Russian Tsar or a Prussian king be put forward as a cherished Polish symbol!). The reality was that after 1870, the Austrians ran a much more lax ship than the Russians or the Prussians. As the Habsburg vessel began to wobble in the 1860s, Vienna decided to try and win the loyalty of her subjects by awarding far-reaching autonomy. 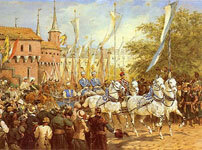 The Hungarians and the Poles were amongst the main beneficiaries, and Krakow was poised for a major renaissance. Not only did Polish become the language of instruction again at Krakow's university, it became the official language of Galicia itself. Poles rose to the highest places in the Empire, even providing a prime minister in 1895. Meanwhile, the censor was kind. With this new-found freedom, Cracovians began cultivating the city's patriotic heritage. Enter the Czartoryski Museum, the Cloth Hall Gallery, the Hutten-Czapski Museum, and many other such institutions that would previously have been impossible. Statues were erected to Polish heroes - unthinkable in Russian Warsaw - and there was an explosion in the arts, especially in painting. The icing on the cake was the return of the Royal Castle to Polish hands. (When the Austrians had first moved in they had grazed horses in the royal chambers). The city was cleaned up, buildings restored, and the Austrian fortifications began to be viewed as protective rather than imprisoning. All this combined to make Krakow Poland's spiritual capital once more - Polish visitors from Russia and Prussia were reportedly in tears at the sight of the reborn Wawel Castle. That said, Galicia was no land of milk and honey. The countryside was backward, and the Austrians drained resources for much of the nineteenth century. Yet Krakow, Lemberg and other cities were on the up come 1900. Austrian and Polish families intermarried, and even a branch of the Habsburgs became proud Polish patriots. Text copyright © Nicholas Hodge, www.cracow-life.com. Reproduced with permission.